Everyone knows that lead is bad; but lead in drinking water is particularly treacherous as it has been found in the water supplies in Flint, Michigan and Sebring, Ohio for example. There has been about a dozen more water suppliers in Ohio and elsewhere in other states, as well. We have all heard in major media, the ramifications of lead in the human body – from brain damage, to kidney failure, the repercussions can have detrimental effects. Most possible water contaminants originate at the source or the water plant, but lead is different. The lead almost always comes from the person’s own water service such as their water pipes, fittings and faucets. If the water delivered by the water plant is not corrosion resistant, lead can dissolve from the home’s interior piping. That is why lead tests are done at customers’ homes. After the water has stood at least 6-hours without being used, it needs time for the lead to dissolve in to the water. As seen in the image above, this is a lead service connection. The corporation valve, which sits on the left side, screws into the cast iron water main, and the lead pipe on the right side connects to the customer’s water line. The service line is just one possible source for lead. Just as likely sources could also include the actual faucet or the soldered joints in the copper plumbing. As big as the lead problem is in Flint, many communities have taken this as a learning opportunity to ensure it never happens where they live. I have worked with the Akron Water Supply for more than 42-years, and there has been an environment of diligence in serving clean and safe water to Akron citizens. As for lead, Akron was generations ahead of this issue. Akron stopped installing lead services, the pipe from the water main to the property line of the house, in the 1930’s. 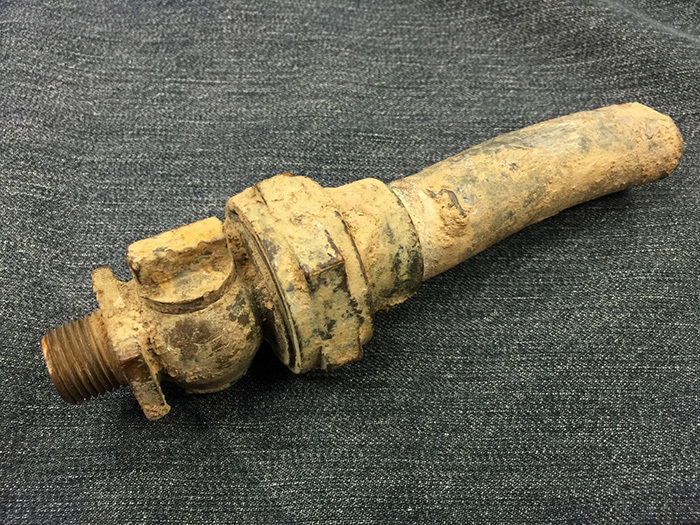 Akron stopped using lead joints in pipes in the 1940’s. Recognizing potential problems with lead, Akron began replacing the approximate 45,000 lead services with copper in the 1950’s with about 4,000 lead services remaining as the replacement program continues. Being a progressive utility agency, in 1982, Akron began adding a chemical to prevent lead corrosion, well before increased regulations were mandated. Akron continues to add zinc orthophosphate today at a cost of about $130,000 per year. 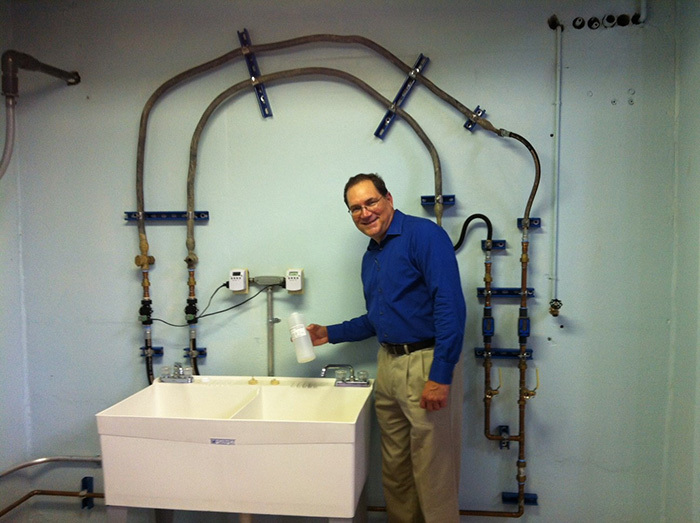 Beginning in 1992, Akron complied with, at the time, a new lead testing program at customers’ taps. This lead testing program continues today as Akron can provide assurance that its drinking water has always met the EPA limits for lead. In addition to the required testing of 50 customers once every three years, Akron tested over 100 additional houses this year to assure concerned customers that lead isn’t an issue in the homes of Akron citizens. The Akron Water Supply is now preparing to test other anti-corrosion treatments for lead using the test pipes pictured below. Shown are two lead service pipes with valves on timers that open and close to simulate normal home usage of two faucets. Lead samples are taken from the faucets and sent to an outside lab for lead testing. So far the apparatus is still coming to chemical equilibrium from the handling associated with removal and mounting. When the lead levels approach the levels before the pipes were removed, we can begin to test different anti-corrosion treatments. As diligent for lead as we have been, the Akron Water Supply gives similar care to protecting the drinking water from the more than one hundred other regulated contaminants including bacteria, viruses, protozoa, algal byproducts, heavy metals, radiological levels, disinfectants and disinfection byproducts, inorganics, volatile organic contaminants, pesticides, turbidity, pharmaceuticals in the environment, and endocrine disruptors. Yes, my family, friends and I drink the water we treat, and I’m so glad to work where I can help assure the quality of our water supply. Lead is in the news now, but every known contaminant gets properly addressed by the Akron Water Supply personnel in Operations, Watershed, Laboratory, Distribution, and Regulatory Compliance. If you’d like to see what else is or isn’t in Akron’s drinking water, we have always been proud to publish the complete list of “All Water Tests” in the Akron drinking water supply at www.akronohio.gov/cms/Water/CCR/index.html. *Ray Flasco is an employee at Environmental Design Group, but works full time at the City of Akron Water Supply Bureau.